In celebration of International Mandela Day, DLS employees set off to Bula Mahlo Orphanage, in Tembisa. A good meal was prepared for the day for the orphanage- giving orphans a treat at least for a day. Food was prepared and served by DLS employees and this was followed by cleaning duties. 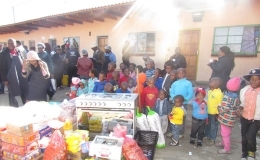 The DLS team also donated groceries and a stove to the orphanage. Everyone worked together in ensuring that the day was a success, from the chopping of vegetables, to the dishing up of the prepared meal. This initiative by DLS ran hand in hand with the “Denel 2 tiger for Madiba” Campaign where employee were asked to donate R20 towards a worthy cause. “Mandela Day is a global call to action that celebrates the idea that each individual has the power to transform the world and the ability to make an impact.